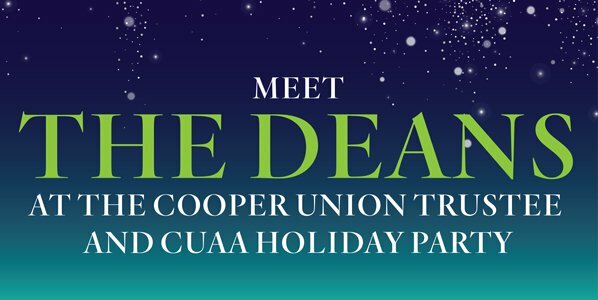 The CUAA, Cooper Union Board of Trustees, and President Laura Sparks invite you to join us for a holiday party. Laura Sparks will lead a conversation with the deans of The Cooper Union, and will welcome Barry Shoop, the new dean of The Albert Nerken School of Engineering. Alumni, family, friends, students, faculty, and staff are invited. Please come have some food and grab a drink with us to celebrate the holiday season! When: Tuesday, December 18, 2018 from 6 p.m. to 8 p.m.
Food, beer, and wine will be provided. RSVP at: cortiz@cooper.edu or 212-353-4269. Food will be provided. Pay as you go for drinks (cash or credit). Phebe’s will be offering drink specials for the evening. The hard work of selecting the 2019 winners has begun. The 4 Award Committees have begun their work. Thank you to all who submitted nominations. The winners will be announced in February 2019. Calling all Graduates of the Last Decade! Thanks to a challenge gift from a generous donor, you now have the opportunity to raise $200,000 for Cooper! Until December 31,2018 every gift will be matched 1:1! This challenge is for the classes of 2009-2018. Please click here to give to Young Alumni Gift. More information to come! The CUAA encourages support of the Annual Fund as the top choice for alumni, parents and friends looking to make donations to Cooper Union. An Annual Fund donation is unrestricted, making it a flexible and instantly available source of student funding that can be used when and where it is needed the most. Please make your tax deductible gift here. Gifts to this year’s Annual Fund may be made through June 30, 2019. 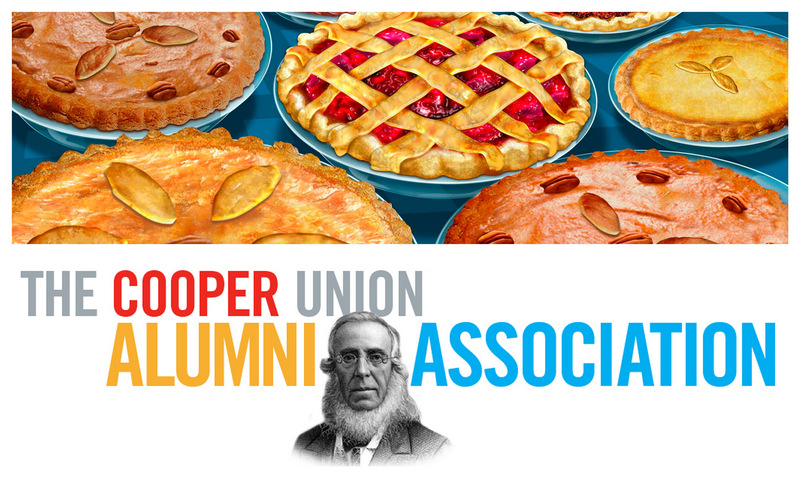 The Cooper Union Alumni Association (CUAA) is seeking energetic and committed alumni to lead our 13,000-member organization. Alumni Trustee, President and other executive level positions are open for terms beginning in Fall/Winter 2019. Responsibilities and qualifications may be found here. 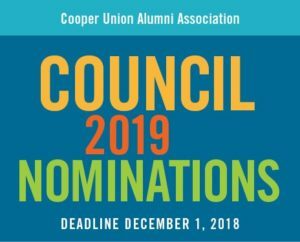 If you or someone you know is passionate about Cooper Union and wants to help direct our association, we welcome your/their nomination. To nominate yourself or someone you know, email contact@cooperalumni.org. Include in the subject line Nomination for (include position). In the body of the email include the name and contact information of the nominee and your name and contact information as nominator. A member of the Nominating Committee will contact the nominee for further information. On September 25th, President Laura Sparks and the Cooper Union Trustees hosted a mixer with the Cooper community at the new 7 World Trade Center. 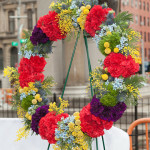 The evening was highlighted by talks by two alumni with strong connections to the World Trade Center site. After a welcome from President Sparks and Trustee Chairwoman Rachel Warren, T. J. Gottesdiener AR’79, managing partner at Skidmore, Owings & Merrill, traced the history of the two buildings that have stood at the site. T.J., who led the firm’s design and construction of the new 7 WTC, described the stunning aesthetic and technical achievements in the new building, which opened in 2006. Julian LaVerdiere A’93 then described the genesis of the Tribute in Light memorial, a commemorative public art installation first presented six months after 9/11 and then every year thereafter, from dusk to dawn, on the night of September 11th. The evening was poignant and inspirational, and allowed all to celebrate the unbreakable spirit of New York and continuing contribution of Cooper alumni to this great city. Mock Interview Night was held on Thursday October 4, 2018. The event allows alumni to help students practice their interviewing skills for internships, employment, and graduate school. The event was great success, with almost twenty alumni participating. Each alumnus conducted a series of 20-minute interviews and 10-minute minute feedback sessions. 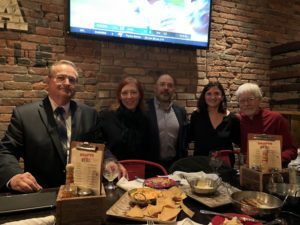 Chicago Alums came together at the home of Zev Solomon Ar’01 and Michal Raz-Russo A’01, the long standing regional leads for CUAA, to meet, greet, and share a school update from President Sparks. Luckily, the Chicago Cubs did not have a home playoff game, which made parking near Zev and Michal’s beautiful home in Wrigleyville much easier. Seventeen alumni from the classes of 1949 to 2013 joined Laura Sparks, Rachel Warren and Elizabeth Rivera to share stories that resonated across the generations and were exemplary of CU’s unique and shared experience. Laura provided an update followed by a Q&A session that gave attendees a better understanding of the issues, as well as confidence that Cooper Union is on a path to thrive and continue its great mission. Cooper Union Professor Joseph Cataldo led alumni on a tour of the Javits Center’s 6.75-acre green roof. The space is the second largest of its kind in the United States and is home to 26 bird species, five bat species and thousands of honeybees. It has become a sanctuary for area wildlife while helping to reduce energy consumption throughout the convention center on Manhattan’s West Side. Chicago Alums came together at the home of Zev Solomon Ar’01 and Michal Raz-Russo A’01 the long standing Regional Leads for CUAA to meet, greet and share a school update from President Sparks. Luckily the Chicago Cubs were not at home for a playoff which allowed ample parking near Zev and Michals beautiful home in Wrigleyville. 17 Alums joined Laura Sparks, Rachel Warren and Elizabeth Rivera from CU and old and new connections were made. The Alums represented the classes of 49, 67, 68, 78, 83, 89, 92, 96, 97, 00, 01, 04, 07, 11 and 13. They shared stories that were enlightening across generations, surprisingly similar in many ways, exemplary of CU’s unique and shared experience. Laura provided a update and answered all questions, Alums left with an improved understanding of the issues and needs, as well as a confidence that CU is on a path to thrive and continue its great mission! 21 Cooper alumni, students, faculty and guests met in the Historic District of Pittsburgh for drinks and appetizers. 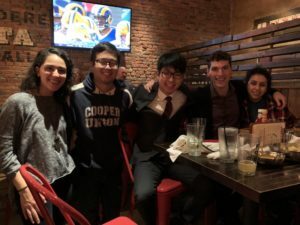 Cooper Union Students had their annual Thanksgiving celebration on Nov. 20, 2018. CUAA Provided and served the pie. The second CUAA Council meeting for the 2018/2019 school year was held on November 1, 2018 in room 215 of the Foundation building. CU President Laura Sparks was the featured presenter. Steven Hillyar has curated an exhibit of thesis projects completed at the school between 1969 and 2018. This year’s exhibit included a preview of the school’s Digital Access Project. We will have a review of the exhibit in our next newsletter. In the meantime, enjoy this video. The Motorsports team recently participated in a promotional video produced by Con Edison about industry support of STEM education. The video features students driving the 2018 car and speaking about what they are learning. The video can be seen here. The Team also produced their own video where they explains how important the program is. View video Eight Juniors and Sophomores from the team traveled to Michigan during the final days of October to use Ford Motor Company wind tunnel to test the new aerodynamic package for the 2019 car. While in Michigan they visited with University of Michigan’s FSAE team and were given a tour of their shop, and they attended a SAE seminar at Lawrence Technical University. The team is raising money by selling team merchandise. Use this link for Motorsports swag. Follow the team on Facebook. The Cooper Hyperloop Team is competing at 2019 SpaceX Hyperloop Pod Competition to be held at SpaceX Headquarters in Hawthorne, California next August. The Cooper Union Hyperloop team submitted their Preliminary Design Report to SpaceX during October, and on November 19th SpaceX informed the team that they are one of the 52 teams who qualified and hence move on to the next phase of the competition. Hundreds of school submitted designs during October. Check out the article in the link for details on the pod design. October Update The team needs to submit completed designs in January 2019. The team needs alumni financial support to test and build the Cooper Pod . Please visit Donate to make our goal a reality. Several Alumni presented papers, moderated sessions, or presided over meetings at the AICHE Annual Meeting held in Pittsburg October 28 – Nov. 2, 2018. They include Kristine Chin ChE’94, Cody Hirashima ChE’15, Evan Granite ChE’69, Dan Lepek ChE’04, Scott Krull ChE’11, and Mary Lynch ChE’82. Kristine Chin is an AICHE Director who organized the Annual Meeting. Evan Granite chaired a session on Carbon Nanofibers and another session on Rare Earth Element Extraction from Waste Streams. He also presented 3 papers. Dan Lepek chaired the session, Best Practices in Research Mentoring and presented two papers. Scott Krull presented a paper on using Near Infrared Hyperspectral Imaging to Monitor Drug Content in Medicines. Mary Lynch Presided over the Local Section Officer’s Meeting and was recognized as a New Fellow. Professor Benjamin Davis participated in the Future Faculty Mentoring Program Meeting. Professor Amanda Stevens was advisor for the Chem-E-Car team. She also co-chaired a session titled, Jumpstart Your Teaching, and presented one paper. The Cooper Union Students on the Chem-E-Car team placed 4th in that competition. They competed against teams from around the world. 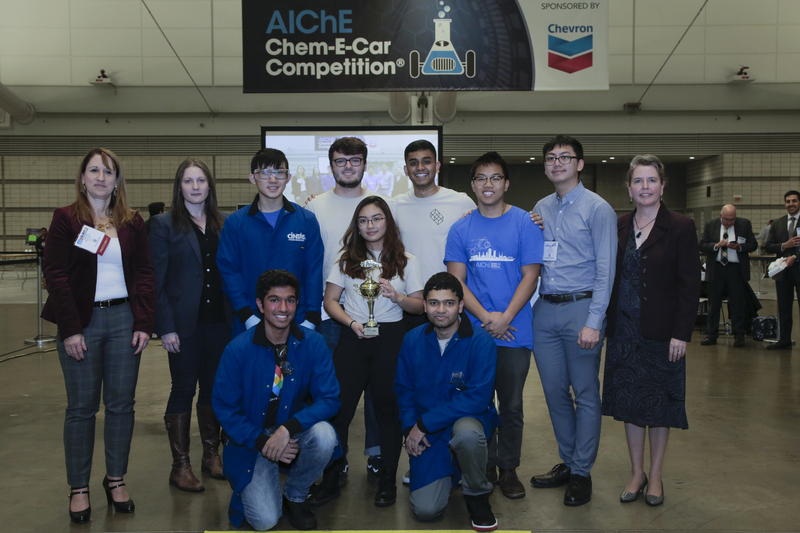 The Cooper Union Team is shown here with AICHE President Christine Stevens of Pfizer and Chem-E-Car Chair, Dona of Chevron. Come back to Cooper to see what our Mechanical Engineering students are up to! December 6, 4 – 6 pm. Forty sculptures are joined by eighteen of Jack Whitten’s paintings, including his entire Black Monolith series, dedicated to African American leaders in art and politics. Jack Whitten A’64 taught at The Cooper Union for more than 30 years and is a member of the Cooper Union Hall of Fame. 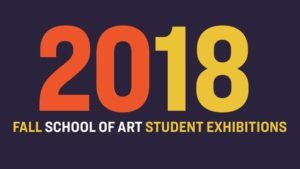 Art Club 2000 consisting of, Daniel McDonald A’93, Patterson Beckwith A’94, Sarah Rossiter A’93, Craig Wadlin A’94, Shannon Pultz A’93, Gillian Haratani A’93 and Sobian Spring A’94, will have an exhibition in SoHo in 2019. Learn more about ArtClub 2000 here.